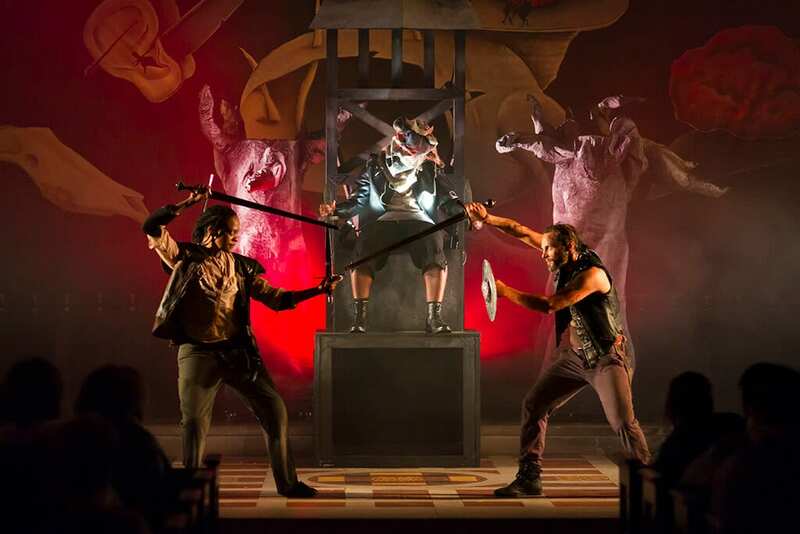 Shakespeare’s Macbeth directed by Daniel Winder is not short of theatrical genius. 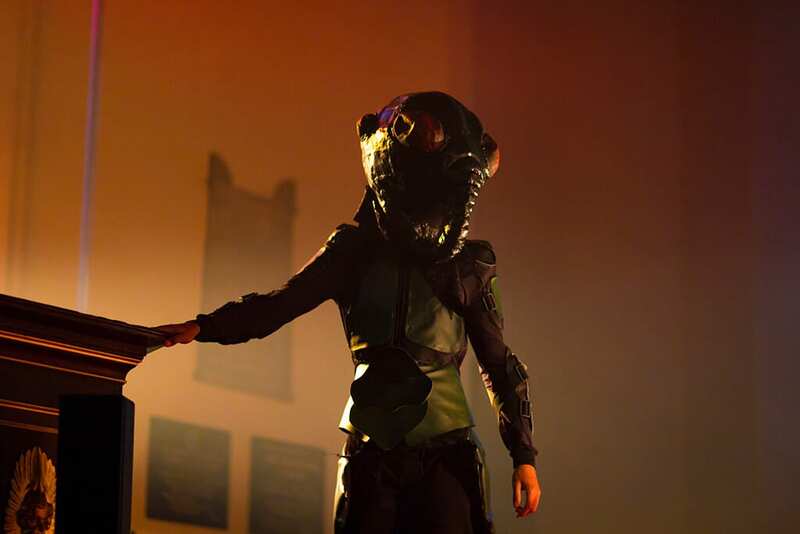 Putting together intricate props and staging along with superb acting, it will leave any theatre goer astounded. Walking into the St Pauls churchyard in the heart of London’s Covent Garden, you can already feel the magical atmosphere it promises. The church is very easily accessible ( only a two minute walk from the underground). The theatre itself is secluded inside a beautiful open air garden, and the unique mixture of the location and the atmosphere within the urban centre of Covent Garden conjures up an unparalleled audience experience mixing grand staging and a close up view. The Director has used the churchyard with great creative intuition. Throughout the play we were changing seats and stages. Overall, there are around four stages, 3 outside and one inside ( so make sure you bring warm clothing to survive the chilly nights!). The seating is not allocated prior to the play and people sit where they like. Looking back, one may say that the stages were a vital part of the play. This can be highlighted with the meeting of the witches and the infamous chant of ‘double double toil and trouble’. In this scene, the audience is sat outside, around a tree. When Macbeth desperately asks for more information from the witches, the tree comes alive. Mouths appear out of the peeking holes in the white sheet covering the tree spouting chilling messages to Macbeth. 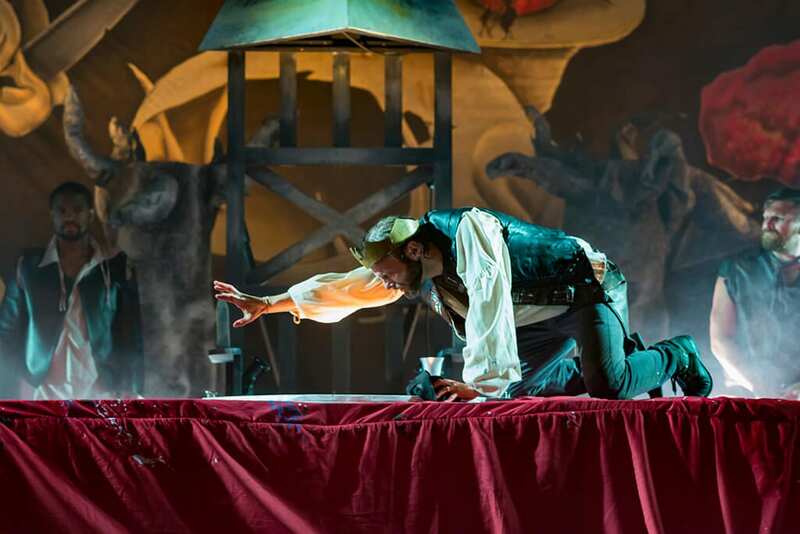 This scene highlights the extraordinary and unorthodox stage in which this play is set. In addition to this, the costumes were exquisite. To portray the hellish nature of the witches, they were dressed up as supernatural, extra-terrestrial creatures, conjuring up the image of terror and fright. The attention to detail in the kings banquet hall is breath-taking, with lighting reminiscent of visions of hell. The play itself was just as astounding. The central protagonists, David Hywel-Baynes who plays Macbeth, and Mogali Masuku, who plays Lady Macbeth, are riveting in every scene. It is in a time of medieval fantasy, and Macbeth along with his wife travel into the grips of the devil. As slowly their sanity strays further away, they pursue further their dream of the crown, which was promised to Macbeth by the three witches. Having chosen a life of cruelty and torture, the pair find themselves paranoid and alone. Egged on by Lady Macbeth, Macbeth kills both the king and his closest friend, in order to tighten his grip on the monarchy, without fear of enemy. What follows is a chilling account of Macbeth’s descent into hell. Both David Hywel and Mogali Masuku bring their respective characters to life. Macbeth signifies the fine line between ambition and humility. When presented with the prospect of the monarchy by the witches, his once humility is transformed into an unquenchable desire, which would lead him into murderous acts. However, Lady Macbeth is the one who spurs him on to make this transformation, and in many respects is stronger and more evil than Macbeth. 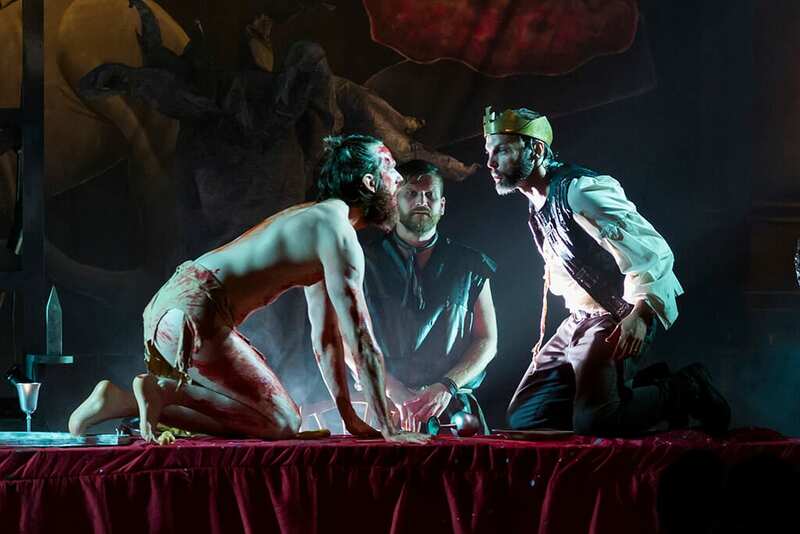 Every spectator will find an aspect that they can connect with in this play, and it would be hard to find a better Macbeth in London which has the interactive genius of this production. The show starts with hope yet ends with despair. Once great Macbeth, who served as a loyal soldier to the king, is by the end a cruel and godforsaken man. The characters are played with gusto and finesse, and with such a small cast, seven altogether, just shows the level of skill involved. All in all, the play is a must-see for all Shakespeare lovers. The combination of great acting coupled with its unique theatre and creative costume does make it a tremendous play. Some might argue that this production’s creativity is both its most defining feature and its downfall. The beauty of Shakespeare is that his words hold the creativity, and little further work needs to be done. It is down to the spectator to work out the underlying features of the play. But, certainly for younger viewers like us, the plays fantastic staging and props more than enhanced the enjoyment of the text. For us, it was perfect.